RLS is one of the most commonly misunderstood vein diseases of them all. Restless Leg Syndrome, will have you constantly feeling that you need to move your legs, even when it doesn’t really make sense. As far as vein diseases go, it is one of the most uncomfortable. So much so that it could cause trouble sleeping or traveling on a plane or in a car long distance. If your legs feel achy, cramped, or tired, you could be suffering RLS. Anyone with varicose veins runs the risk of developing open sores or leg ulcers. An estimated 5-10% of varicose vein cases develop into open sores or ulcers. If these sores go untreated and do not heal correctly, they can become extremely painful. 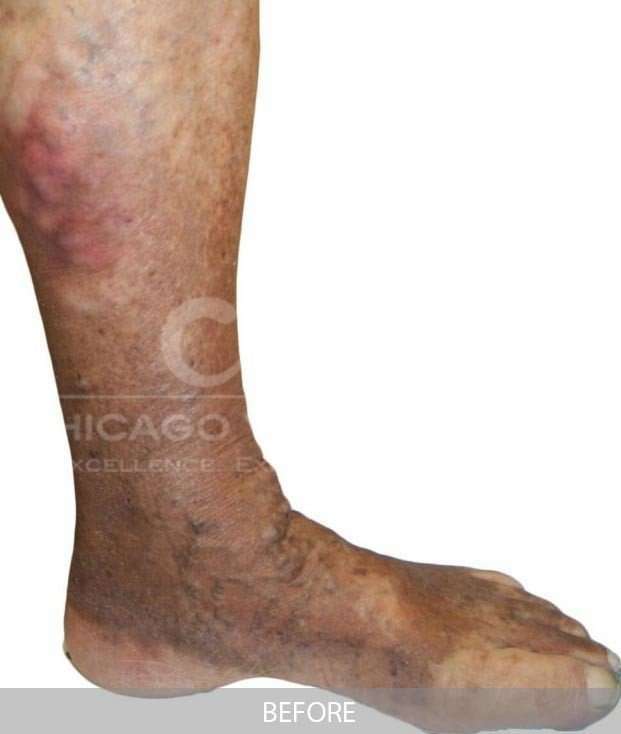 Chicago Vein Institute has a vein treatment plan that combines wound care, EVTA, and sclerotherapy as needed to treat this chronic and painful condition. Do you have smooth, tight skin along the length of the leg? Often you will be able to see discoloration and scarring in the same area. These are all symptoms of Lipodermatosclerosis. If vein disease in the legs goes untreated for long periods of time, this issue can begin to develop. A vein treatment plan in Chicago at Chicago Vein Institute will identify and treat Lipodermatosclerosis before it has the chance to progress into a more serious condition. Corona phlebectatica often shows itself as blue spotty patches on the skin. It most often occurs in the lower legs, ankles, and feet. They are spider veins that become interwoven. This will give the skin around the ankle a dark red, pink, or blue coloration. 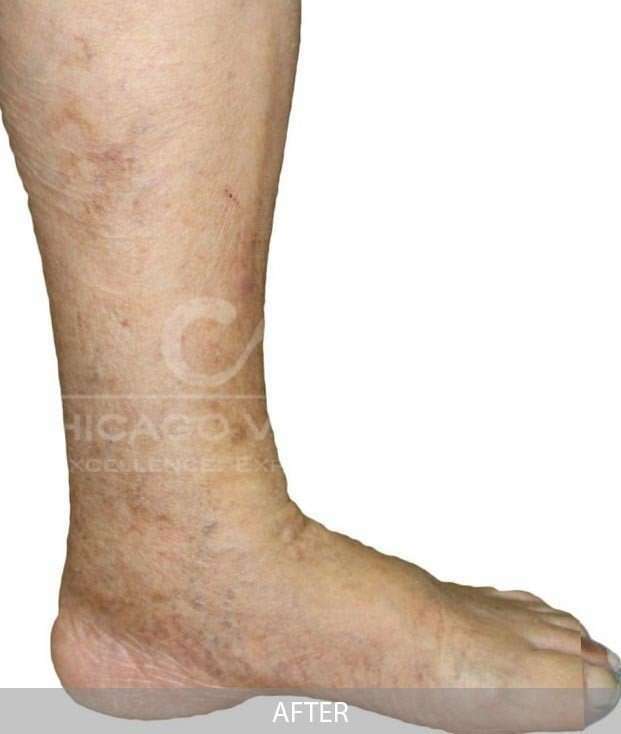 Corona phlebectatica is often a sign of advanced vein disease. It needs to be treated quickly. Blood can begin to pool in the ankles as a result of your vein valves not functioning correctly. When they are unable to open and close as necessary to filter the blood, it remains stagnant. This is known as edema. It often shares the same look as a birth mark, but Klippel-Trenaunay Syndrome is much more serious. It can change the skin’s appearance and cause the varicose vein and the leg to swell and change in coloration. KTS is a rare vascular disorder in which your limbs could experience large varicose veins and excessive soft tissue growth. Skin changes to a darker color as a result of advanced vein disease. If you are experiencing hyperpigmentation, get in touch with your doctor or one of us at Chicago Vein Institute. Throughout the course of your vein consultation, issues like hyperpigmentation can be found quickly and treated. Click and drag the slider bar to reveal the life changing results Chicago Vein Institute patients have been able to acheive.